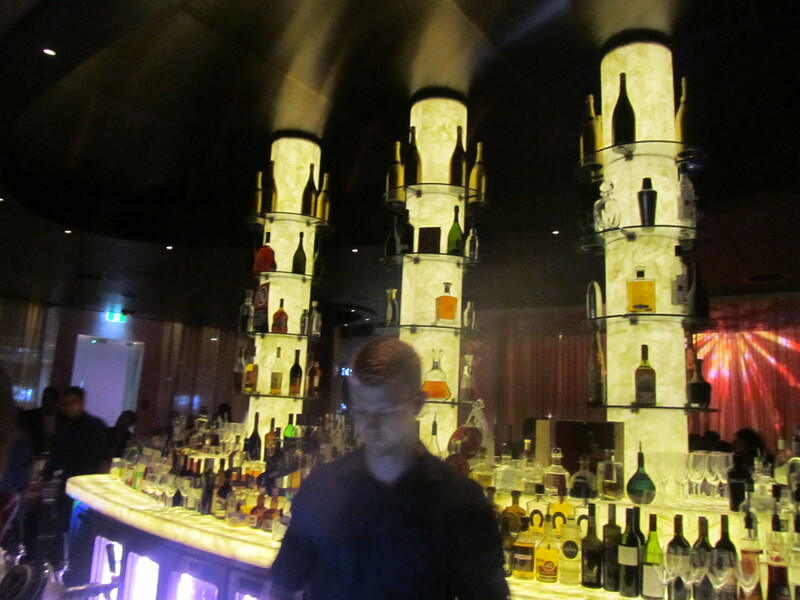 Last Saturday night I had the pleasure of a night out at the Star casino with friends. 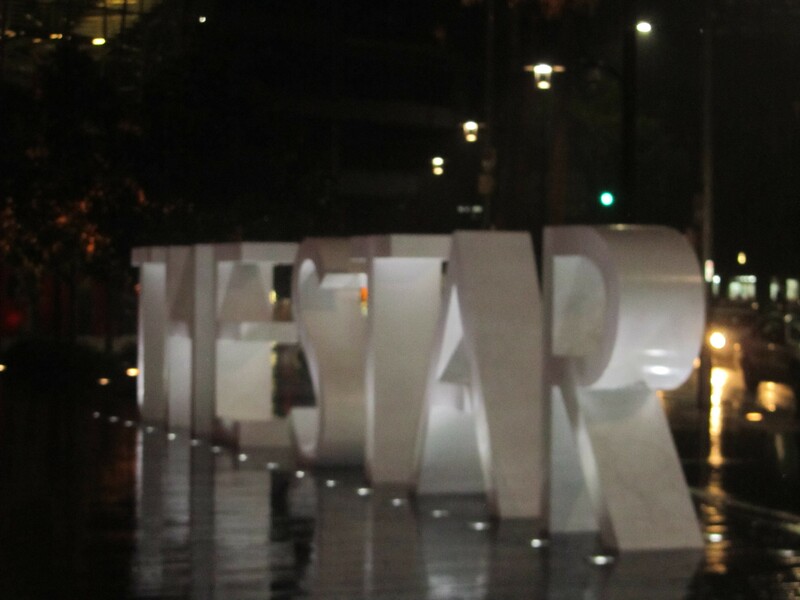 I had been meaning to check out the Star since its big refurbishment project (which apparently cost over $850 million), including a new entrance to the harbour, new fine dining restaurants, bars and cafes, and new luxury stores and hotel. The Star, (formerly Star City Casino) was reopened under this new name in September 2011. 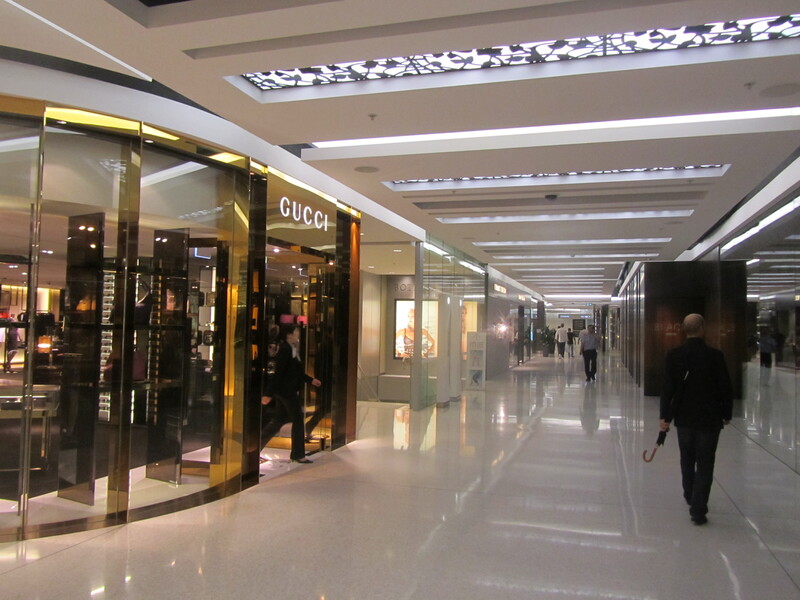 The Star has been given a new ‘facelift’ with an impressive glass entrance and a chrystal stalactite chandelier ball hanging from the ceiling, the luxury stores and restaurants in the entrance have definitely given the casino a very ‘luxe’ new look. 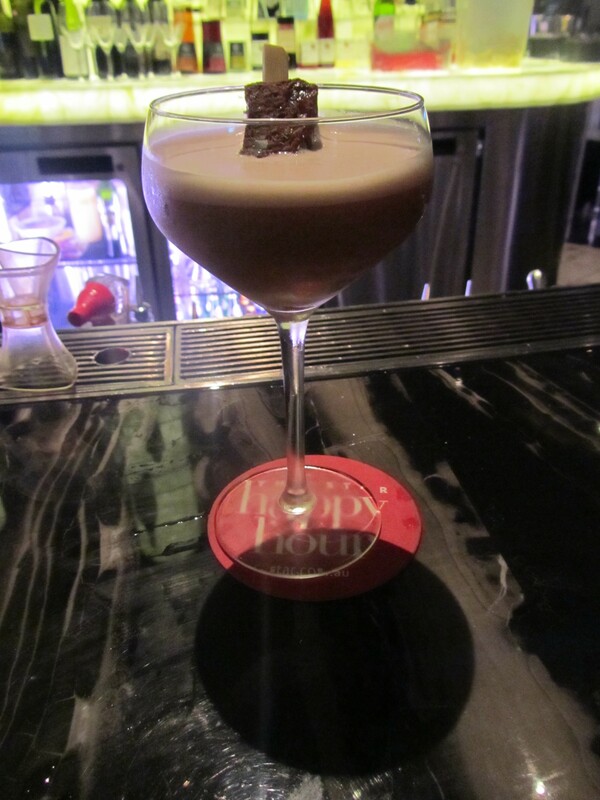 We started the night with cocktails and dinner in one of the new fine dining restaurants, Black by Ezard. The restaurant has a very sleek decor, dark wooden tables with floor to ceiling glass windows overlooking the beautiful Harbour and Sydney skyline. As we are seated, we are presented with an ipad to scroll through their impressive drinks menu – including an interesting cocktail list and an extensive list of world wines. 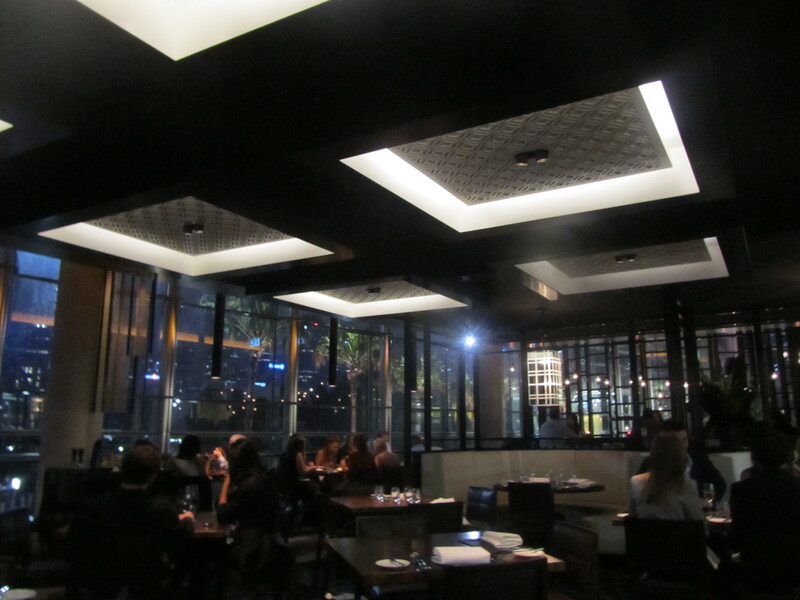 The dinner menu is impressive – an array of contemporary Australian with modern asian and modern European influences. Each of the dishes (particularly the starters) sounds so interesting it’s hard to chose! 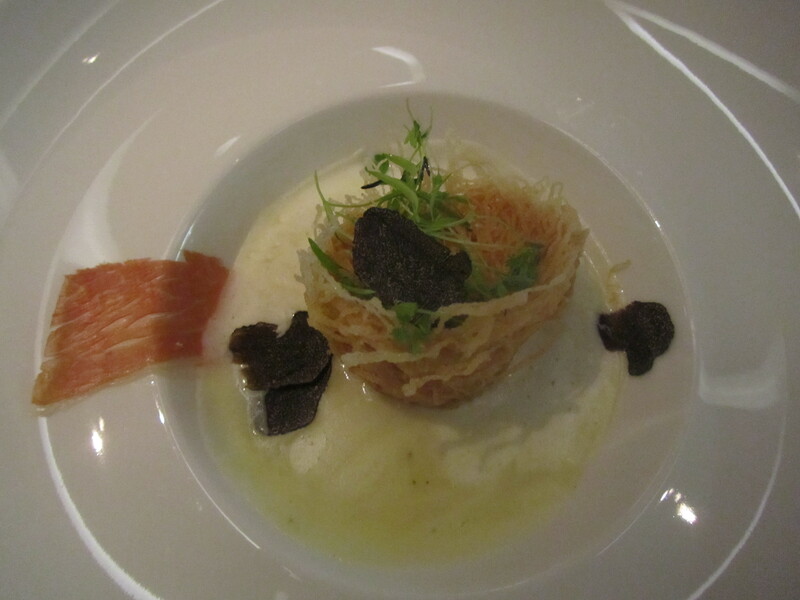 I had to try their signature dish, an entrée of crispy organic farm egg with potato cream, black truffles and Iberico Jamon and herb salad, $36 – the crispy organic farm egg is served like a ‘birds nest’, the cruncy textures of the egg with the creamy flavours of the potato and of course the black truffles are devine, combined with the saltiness and smoothness of the iberico ham. D-E-L-I-C-I-O-U-S! 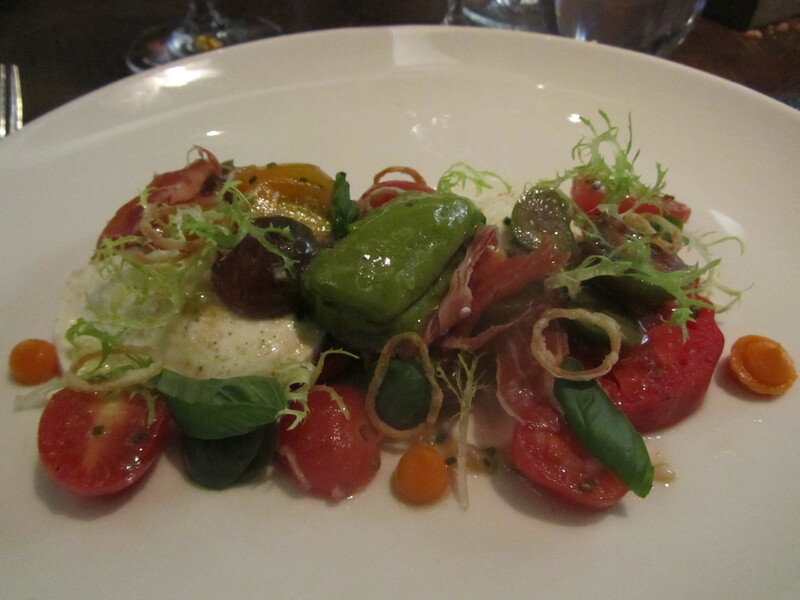 We also tried the tomato salad 19, beautifully done – fresh sweet heirloom tomatoes, with a creamy basil sorbet, mozzarella cheese and Serrano ham. This was the most beautiful steak I have ever eaten (outside of Argentina! ), the beef was so tender I was slicing it like a butter, and it was beautifully cooked (I believe it was seasoned the Brazilian style, with rock salt, just how I like it). 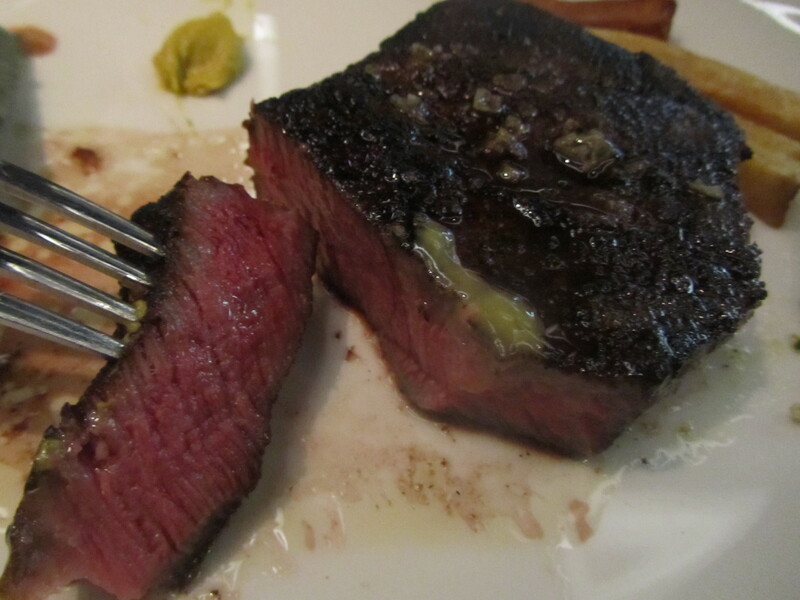 You can order sides sauces with your steak, but why dilute the taste of a perfect steak? This wagyu definitely must have had a good massage and been listening to some soothing music as it was so tender and juicy, it really melt in my mouth!! After eating that beautiful meal, I had to try their dessert. 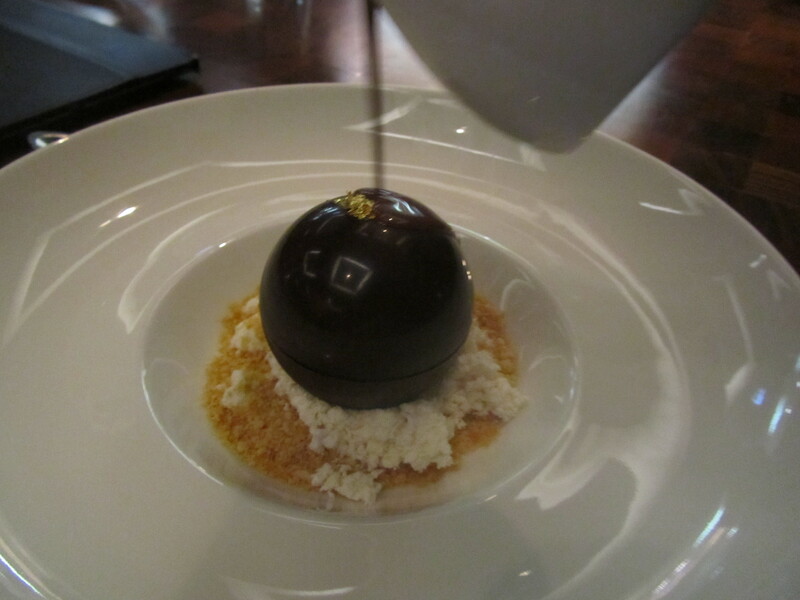 I ordered the Chocolate (Warm couverture ganache, dulce de leche ice cream, peanut butter mousse. 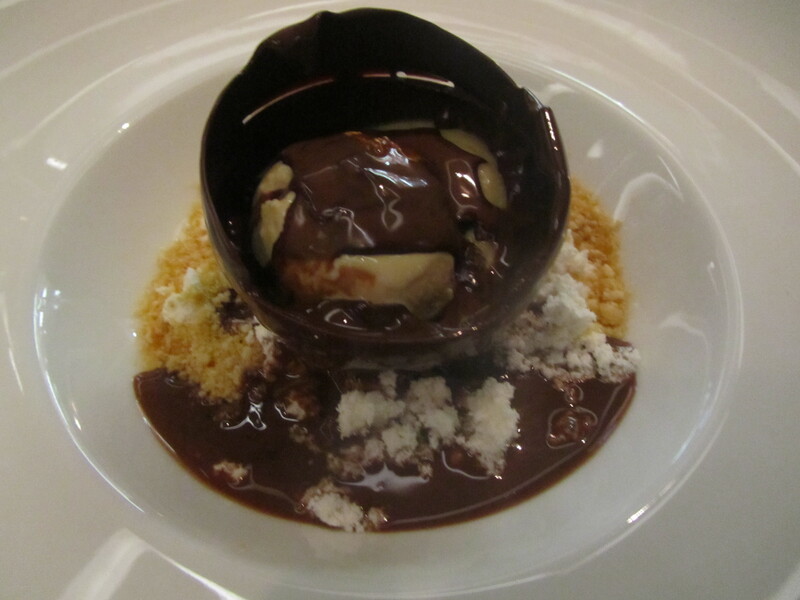 The dessert arrives, a chocolate sphere, which the waiter then pours the warm couverture ganache over. As I bite through the dessert, a burst of chocolate goodness, the dulche de leche ice cream and peanut butter mousse melt in my mouth with the chocolate flavours ‘oozing’ through. Now this is a chocoholics HEAVEN! It was a thoroughly enjoyable, very indulging dinner, and at $145 pp (including drinks) was not cheap – definitely one to save for the special occasions. After dinner we hit the casino, I had my fun on the roulette tables, my hubby at the black jack tables, and then we ended the night with cocktails at the Cherry Bar. 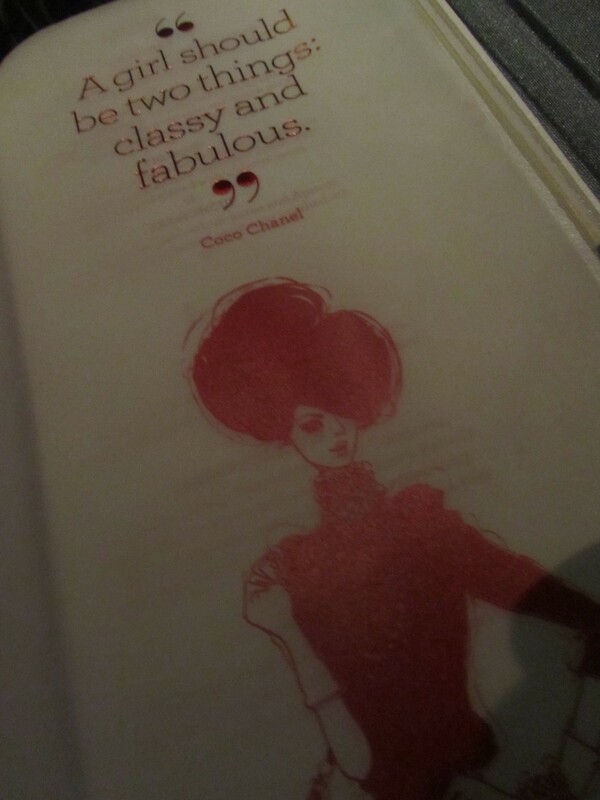 It was a wonderful evening at the Star. Wow it looks amazing! I haven’t had the chance to check it out yet but I definitely want to! The food looks great. OMG! The chocolate and peanut butter mousse dessert sounds delicious!!! !